Home› News › Enjoying the Weekend. The weekend has been nice so far. We got our closing date on the house which will be June 3rd. So basically we will sign the papers, get the keys, and we will run right over and start doing things. I can’t wait to clean that back yard out, I’m totally ready. Friday night we went to our friends house to play some board games. One game in particular was probably the best/worst game I have ever seen. 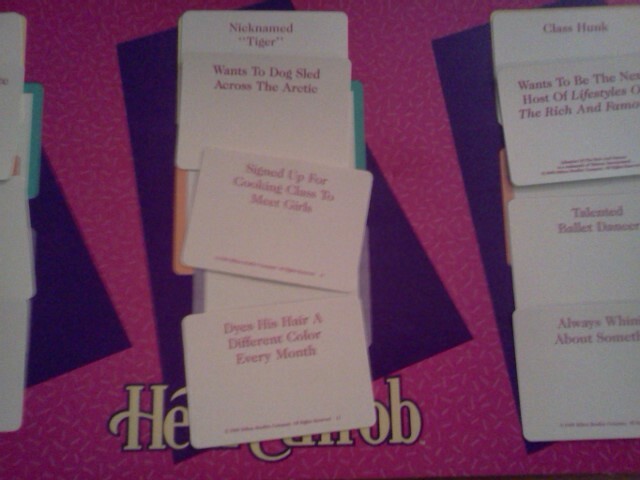 The game was called “Heartthrob” and was totally ridiculous. 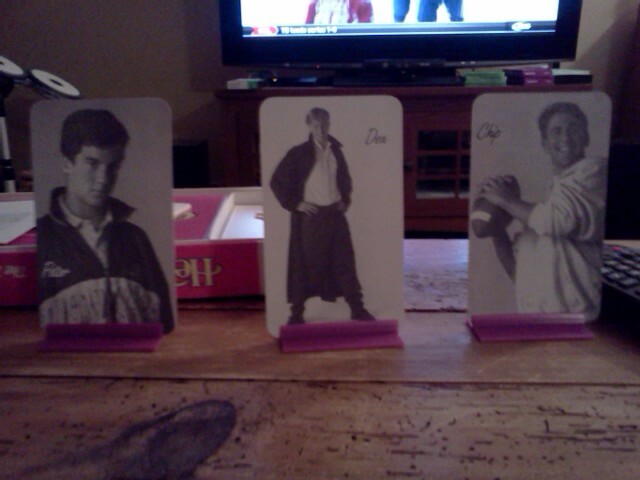 Three cards are drawn with three dudes, all insanely attractive. They are presented on the table so that everyone can see how hot they are. Pictured here are Peter, Dex, and Chip. We knew it was going to be tough with how hot these dudes were. Each of us is handed a paper where we write down which dude we think is the hottest. Then we write down which dudes we think the other players think are the hottest. The object is to guess who everyone is going to choose and for each one that you guess correctly you get one point. The picture is a bit blurry but clearly you can see that Dex is by far the most awesome. 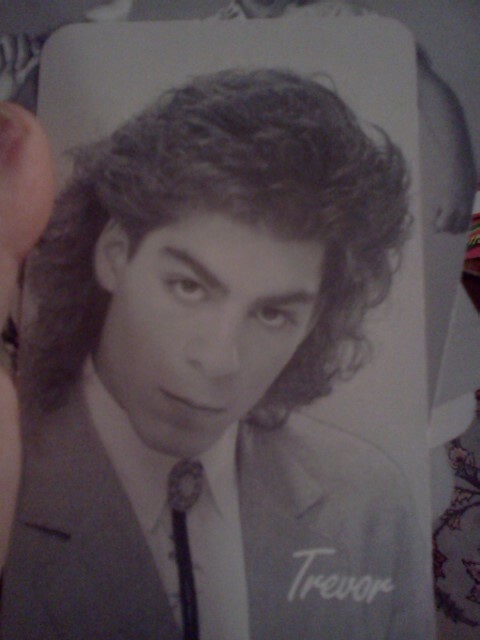 I mean come on, he has a duster. In the second round we are to lay out some of the personality traits which are random cards placed onto the board with really amazing facts about each dude. Again, after this round of personality traits, Dex was by far the coolest. Lets think for a second. A duster, nicknamed “Tiger”, really wants to dogsled across the Arctic, signed up for cooking classes to meet women, and dyes his hair a new color every month? Is there really any doubt who the best is. 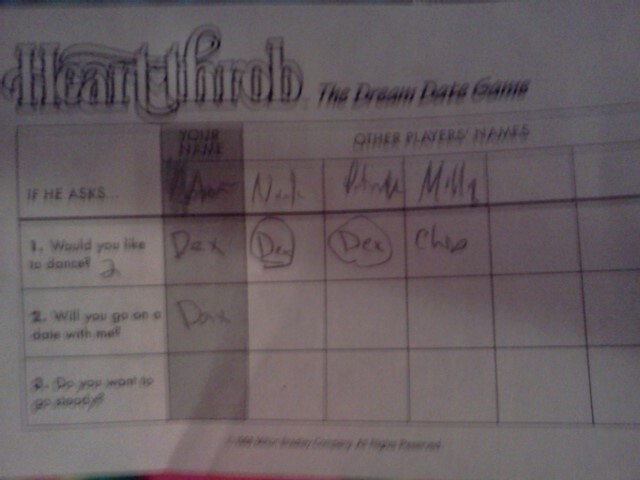 Clearly its Dex. We only played one round of this game for the simple fact that all of us except one chose Dex and at the end of the game all of us had the same amount of points so there was no winner. A terrible game, but it was good for a laugh. Why didn’t we at least give it a second chance? Well if Trevor was one of the dudes in the next round, I’m pretty sure it would have been the same result.